In organic chemistry there are two basic and complementary problems, analysis and synthesis. By analysis the chemist attempts to find the number, kind and spatial arrangement of the atoms in his molecule; only then is he in a position to attempt its synthesis out of the elements. By the labours of thousands of chemists for more than a hundred years the vast edifice of modern organic chemistry has been built. This knowledge has been achieved by painstaking analyses and syntheses and by logical processes of deduction and induction from a few relatively simple valency concepts. But in spite of this vast progress an almost infinite field still lies ahead, as chemistry advances towards the more complex molecules associated with living matter. Some of these structures have only been elucidated by the work of large teams of chemists over a dozen years or more, and many others still remain unsolved. This whole situation is now changing dramatically. Within the last few years it has become possible to determine the structures of organic molecules containing up to 100 atoms or more by the methods of X-ray crystal analysis. Provided that suitable crystalline derivatives can be prepared (and we certainly know enough chemistry to be able to do this) then the structures can be determined accurately in almost every case without fail, even if the chemical formula is quite unknown. Furthermore, this can now be done in a relatively short time. Last December we obtained a suitable crystalline derivative of a complex curare alkaloid. By mid February we had determined the structure completely in three dimensions with an accuracy sufficient to give the bond lengths to within a few hundredths of an Ångström unit. These advances are now radically changing the whole outlook in organic chemistry and are enabling the chemist to come more quickly to grips with his other fundamental problems of mechanism, biogenesis and synthesis. How these very great advances in the science of the X-ray analysis of organic structures have come about during the last fifty years is the subject of this article. It may perhaps be convenient to paragraph this account very roughly into the five decades that have elapsed since Laue's original discovery of X-ray diffraction in 1912. During the first decade very little was accomplished in the field of organic molecular structures. In the second decade (1922-1932) the analytical methods were mainly one-dimensional, and considerable advances were made in the structures of the long chain compounds, for example. The third decade (1932-1942) saw the extensive development of two-dimensional methods and the solution of numerous aromatic structures. In the fourth decade (1942-1952) three-dimensional methods were introduced, and it is perhaps not too far fetched to say that during the last decade (1952-1962), with the introduction of still more refined techniques which can determine the thermal as well as the positional parameters of the atoms, a kind of four-dimensional analysis is now possible. This is, however, a very superficial summary and other more important and more fundamental advances were made during these different periods. Apart from some early observations on crystalline waxes1* and a few other compounds, organic structures were not really attempted during this first period. Reference should be made, however, to the successful determination of the fundamental mineral structures diamond2 and graphite3 which proved to be the prototypes for the atomic arrangements present in aliphatic and in aromatic compounds respectively. The significance of the measurements of the basic interatomic distances in these structures became clear much later. *Numbered notes are found at the end of this Chapter. This period saw the beginnings of the first concerted attack on the structures of molecular crystals, as opposed to the elementary and simple ionic crystals that had been the main object of previous study. In the early twenties W. H. Bragg4 published an extensive account of his X-ray measurements on a number of fairly complex organic crystals, including naphthalene, anthracene, acenaphthene, α-and β-naphthol, and benzoic acid. This work did not succeed in determining any of these structures at all fully but it produced strong evidence that the 'molecule' of the organic chemist did have a real existence in the crystal, and that the rings of atoms postulated in the naphthalene and anthracene structures, for example, must have dimensions closely similar to the carbon rings already known to exist in diamond and graphite. The arrangement and general orientation of the molecules in the naphthalene and anthracene crystals were correctly deduced, and this was substantiated later by a more detailed survey5 of the intensities of the spectra. These important results initiated the X-ray study of organic molecular crystals. However, when attempts were made to go further and postulate detailed atomic structures on the basis of cell dimensions and perhaps a few intensity observations, the results were in general disappointing and even misleading. With a few very notable exceptions, some of which are described below, it can be stated that nearly all the work on organic crystal structures published before 1932 is quite unreliable in so far as it attempts to describe detailed atomic arrangements. The most notable exception, and indeed the very first organic crystal structure to be completely and accurately determined, was hexamethylene tetramine (I). Dickinson and Raymond's6 remarkable determination of this structure owed its success to the fact that the crystals are cubic, with only two molecules of C6H12N4 per unit cell, and that the carbon and nitrogen positions can be completely defined by only two parameters. These were accurately determined, giving a carbon-nitrogen distance of 1.44 Å and a molecule of the shape shown in Fig. 10(1) with the four nitrogen atoms tetrahedrally and the six carbon atoms octahedrally grouped about a common centre. The chemical formula (I) was thus definitely proved. Fig. 10(1). Molecule of hexamethylene tetramine (Dickinson and Raymond, 1923). Amongst the hundreds of thousands of organic crystals such highly symmetric examples are difficult to find, and progress was correspondingly slow. 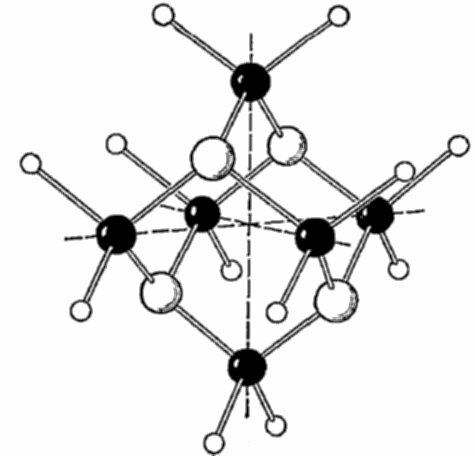 Perhaps the most important and outstanding example of a complete structure determination during this decade, and one which did not owe anything to high space-group symmetry, was hexamethylbenzene, C6(CH3)6, determined by K. Lonsdale.10 The system is triclinic, with one molecule in the unit cell, so 36 independent parameters for the carbon atoms have to be found. There is, however, one great simplifying feature. The good cleavage plane (001) is found to give an exceptionally strong reflection of which all the higher orders fall off uniformly in intensity in the same manner as those from the basal plane of graphite. The conclusion is inescapable. The molecule must be planar and lie exactly in this plane. Detailed analysis carried out on the basis of a regular hexagonal model led to excellent agreements and showed that the planar benzene ring was of about the same size as the graphite carbon ring (C-C = 1.42 Å) and that the methyl groups, also in this plane, lay at a slightly greater distance. These results were of fundamental importance and provided a key to the structures of all aromatic molecules. This chapter would not be complete without a reference to the brilliant work of Muller, Shearer and others on the structures of long chain compounds. Just as graphite and hexamethylbenzene provided a key to the structures of aromatic compounds, so diamond and the long chain hydrocarbons provided an equally essential key to understanding the structures of aliphatic compounds. These two X-ray results now verified in a purely physical manner the two fundamental valency postulates of organic chemistry. The early work on the long chain compounds was not complete in the crystallographic sense. 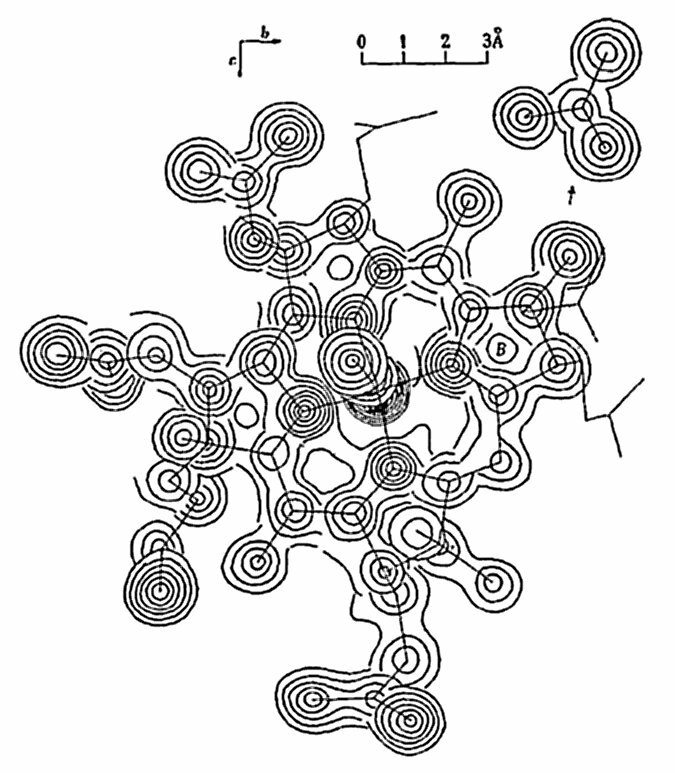 Single crystals were extremely difficult to obtain but very accurate information about the geometry and dimensions of the zig-zag chains was deduced, particularly by a study of very high-order reflections.11 In another notable and very early study by Shearer12 the Fourier series method was employed to fix the positions of the carbonyl group in a series of unknown long chain ketones and to determine the number of carbon atoms. This is probably the first application of the X-ray method to the determination of chemically unknown organic structures, and one of the first practical applications of the Fourier series method. In all the structures described above there has been some simplifying feature. The long chain compounds present what is mainly a one-dimensional problem. High space-group symmetry with many atoms in special positions account for the success in other cases, while hexamethylbenzene is almost unique in that all the atoms lie in one crystallographic plane. During the decade that we now describe there was an enormous development both in the power of the analytical methods and in fundamental theory. The Fourier series method was developed13 and the computational problems simplified14 so that it could be applied as a useful and practical tool in two-dimensional work, and as a powerful method of refinement. Thus, if a model of the molecule could be postulated from a knowledge of the chemical structure, and its orientation in the crystal described in terms of not too many parameters, then by trial and error, guided by optical and magnetic properties, a rough approximation to the structure could sometimes be found. This could then be refined by Fourier series methods until a highly accurate picture of the molecule was obtained, from which bond lengths to within a few hundredths of an Ångström unit might be estimated. In spite of these great advances, however, only in very rare cases was it possible to solve the structures of molecules to which the chemist had not already been able to assign a structural formula. One exceptional case of great importance occurred as early as 1932 when Bernal,18 by a few simple X-ray measurements, played a great part in the chemical elucidation of the correct skeleton formula for the sterols.19 Exact solutions for such structures were, however, out of the question. It must be recalled that in the field of organic chemistry we are dealing with molecules that may contain up to 50 or more atoms in addition to hydrogen, and all of very similar scattering power. Without some knowledge of the structural formula to limit the possibilities it is clearly impossible to set up trial structures containing any reasonable number of parameters. To solve chemically unknown or partially known molecular structures a more fundamental approach was necessary. The foundations of such an approach, which is only now coming to full fruition, were laid during the 1930's. The Patterson vector method20 was discovered in 1934 and the Harker synthesis21 in 1936. This approach does not attempt to solve the phase problem but instead it portrays in an elegant manner all the information that can be obtained from a knowledge of the magnitudes of the structure factors, introduced as F2. The result is a map not of the atomic positions, but showing the superposition of all the interatomic vectors in the crystal. This direct information is immensely valuable and has been used, and is being used, in almost every crystal structure investigation undertaken since that time. For the complex organic structures with which we are now concerned, however, this is not enough. The number of vectors goes up with the square of the number of atoms, and when this number comes to a dozen or more, the chance of being able to resolve the separate vector peaks is very small indeed. The methods that have proved effective in solving very complex and chemically undetermined organic structures were evolved soon after Patterson's discovery, and they represent a chemical rather than a physical or mathematical approach to the solution of the phase problem. They are known as the isomorphous substitution and heavy atom methods, and they were first developed and applied to organic structures in the case of the phthalocyanines.22 The problem is to determine the unknown phases of the resultant waves which are scattered by all the atoms in the crystal. Only the amplitude can be measured. A chemical experiment is now performed and an extra atom, preferably of higher scattering power than the others, is inserted at a known point in the structure, or at a point that can subsequently be determined by a simple application of the Patterson method. The effect of this extra contribution to the resultant amplitudes is observed, and from the changes that occur many of the original phases may be deduced. Phase differences which cannot be measured are thus transformed into amplitude differences which can be measured. An earlier observation on isomorphous substitution was made by J. M. Cork23 when studying the inorganic alum crystals, but the full significance of the effect was not appreciated, and indeed the crystal structure concerned was not solved, at that time. The phthalocyanine structures represent a beautifully simple and complete example. The electron density map representing the principal projection of nickel phthalocyanine is shown in Fig. 10(2). The central nickel atom can be removed or replaced by another atom without disturbing the remainder of the structure. Hence the phases of nearly all the reflections could be determined by the isomorphous substitution method, and most of them by the heavy atom method alone, which involves the use of only this derivative. As a result this analysis was accomplished without the need of any chemical assumption, and indeed without postulating the existence of separate atoms in the molecule at all. Almost unlimited possibilities for the analysis of complex structures were thus opened up. Very few molecules exhibit such high symmetry or afford such perfect isomorphous substitution as the phthalocyanines. But the more general heavy atom method has a wider application. It should be realized that the organic chemist is generally interested in determining the structure of some molecular species, rather than the structure of a particular crystal. And from a given organic compound it is nearly always possible to prepare a series of derivatives, containing, for example, the halogen atoms chlorine, bromine, or iodine. Again, if the compound is an acid, then a series of heavy metal salts may be prepared. If the structure of such a derivative, obtained by simple addition or substitution reactions, can be determined, then we have effectively determined the structure of the parent compound. Fig. 10(2). Electron density projection for nickel phthalocyanine. 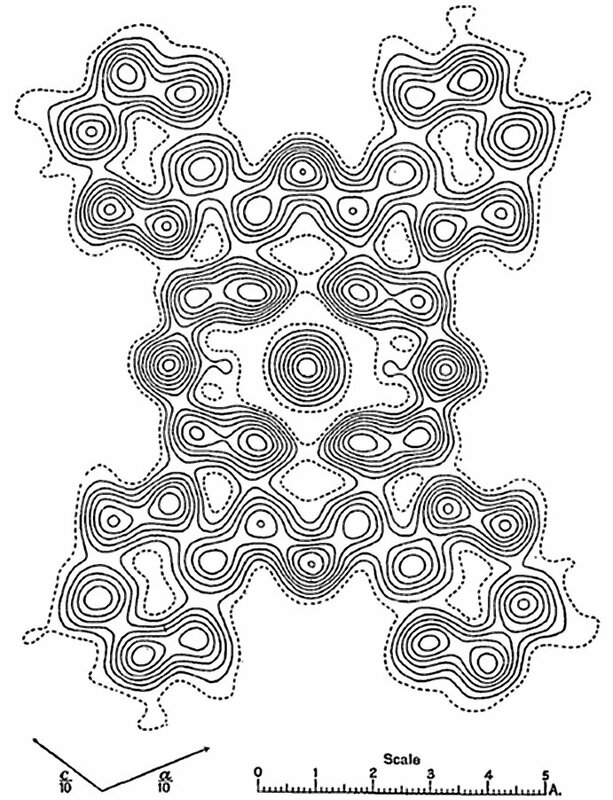 Contour lines at unit electron density intervals, except on the central nickel atom where the interval is 5 e.Å-2 per line (Robertson and Woodward, 1937). The prospects of being able to make a great contribution to organic chemistry by the X-ray method thus appeared to be extremely bright, and were much discussed.24 Many complex crystals had been looked at in a preliminary way, and it was suggested that if a mercury atom could be substituted for zinc in the insulin crystal25 then X-ray analysis of a structure even of this complexity might become feasible. This prediction is now being realized for some protein crystals, but in 1939 it was still too early, for reasons which we shall presently discuss. Exact structures for molecules of this complexity, however, were not yet systematically possible. For exact analysis it was a case of finding a molecule that would fit the methods and techniques available, rather than of applying these techniques to a specified series of compounds. The limiting factor was really the effective restriction of the methods of analysis, and especially the powerful Fourier method, to two-dimensional work. To obtain precision it was thus a necessary condition that it should be possible to resolve the atoms in some projection of the structure, and the separation required for resolution, with the usual X-ray wave-lengths and reasonably good organic crystals, is about 0.6 Å. It was no accident that during this period the most effective and important studies were carried out on aromatic compounds with planar molecules. If the molecule is planar, and the unit cell is not too large, there is always a good chance of being able to resolve the atoms in some projection. On the other hand, if the molecule has a complicated three-dimensional shape, then many of the atoms will overlap in any projection because these separation distances will in general be much less than the minimum required for resolution. So even if the phase problem can be solved, by some of the methods outlined above, a solution capable of precise interpretation may not be reached in two dimensions. Another decade and more had to elapse before the full power of the X-ray method in three dimensions was revealed. Before leaving this period reference should be made to the important X-ray work that was carried out on a number of macromolecular structures. In fibre structures the crystallinity is generally low and the chemistry complex. Detailed and fully quantitative X-ray studies can hardly be expected. On the other hand the importance of fibre structures is outstanding because they are almost universal constituents of living matter. Biochemical structures do not come within the scope of this chapter, but some brief references will be made because the line of demarcation is hard to draw. In the field of natural fibre structures a fairly reliable model for cellulose was deduced by a combination of chemical and X-ray evidence.29 The isoprene polymers, rubber and gutta-percha, were also studied in some detail30 and shown to be cis- and trans-modifications of the polyisoprene chain. The fundamental researches of Astbury on the fibrous proteins also commenced during this period, but these definitely belong to the biochemical field and will not be described here. A slow start was made with X-ray crystal analysis during this period because of the interruption of the war, but before the end of the period quite spectacular progress had been achieved, culminating in the complete elucidation of such important structures as the alkaloid strychnine and the antibiotic penicillin. Although this chapter is not immediately concerned with the development of the technique of crystal structure analysis, we must again make some reference to such developments in order to understand the sequence of events. In the field of organic structure determination by X-ray methods there are perhaps two main objectives. One is concerned with the ever more precise measurement of bond lengths, angles, and ultimately the complete electron distribution in comparatively simple molecules. The other is concerned with the elucidation of the more complex or more difficult structures that the organic chemist has not yet been able to master completely by the classical methods of his science. For both these objectives the power of the analytical methods at the disposal of the crystallographer is always the limiting factor. All these developments led to important results; but of greatest immediate practical importance was the simple yet prodigious problem of computation. We have seen that in the 1930's two-dimensional methods of analysis were supreme. This was because it was about the limit of what was practicable, with the hand and desk methods of computation then available. However, there was now an urgent need to move into three dimensions. To appreciate the problems involved, let us consider some simple examples. The kind of calculations required may be typified by the summation of a Fourier series. The calculations of structure factors, vector distributions, etc. are similar in kind, and these operations have usually to be carried through many times in the course of one analysis. Now, to evaluate a two-dimensional electron distribution of the kind shown in Fig. 10-2 for the phthalocyanines, a series containing about 200 terms (structure factors) has to be evaluated and summed at at least 1500 points over the area. This involves dealing with a total of about 300 000 quantities which have to be evaluated and added in groups. Many ways of shortening the work were devised in the 1930's, but the computational burden was still heavy, remembering that this kind of operation had usually to be repeated many times before the analysis was completed. The three-dimensional analysis of a moderately complex structure, however, may require a series of at least 2000 terms which has to be evaluated at a minimum of perhaps 50,000 points throughout the volume of the asymmetric unit. Some 107 quantities are now involved, and life is too short for a task of this kind to be performed by the methods hitherto available. All these problems have now been solved by the invention of electronic digital computers, but in the period we are now discussing these machines had not yet been invented. Although development work started on them in the 1940's they did not become at all generally available until later in the 1950's. One supremely important event which did take place much earlier was the development of the magnificent electronic analogue computer (XRAC), designed and built by R. Pepinsky and his colleagues.37 Although the output is essentially two-dimensional, this machine can be adapted for three-dimensional work and it is capable of producing sections or projections, like the one illustrated in Fig. 10(2), fully and accurately drawn out on the oscilloscope. As soon as the amplitudes and phases are set up on a series of rheostat dials, the summations are performed instantaneously. This machine played and is still playing a great part in speeding up structural work. Another important development on the computational side in the 1940's was the utilisation of punched card computing and tabulating equipment (Hollerith or IBM) which was now becoming commercially available.38 Most of the three-dimensional analyses during this period that we now describe were aided by some of these developments, but the work was often still laborious and heroic efforts were needed to achieve success. It should be mentioned again, as in previous sections of this chapter, that nothing like a complete account of the achievements in organic structure determination can be attempted here. A very complete account and references will be found in the seven large volumes of Structure Reports that cover this decade. The feature of the period was undoubtedly the introduction of three-dimensional analysis and the improved methods of refinement that became available. In the simpler molecules this led to much greater accuracy and reliable estimates of probable errors. Whereas formerly bond lengths could be estimated to within a few hundredths of an Ångström unit, they could now, in the most favourable cases, be estimated to within a few thousandths. In the complex structures it became possible towards the end of the period for the crystallographer to contribute actively to the solution of structures that were still to a large extent chemically undetermined. We begin with an account of some simple structures, and a good example to illustrate progress is one to which we have already referred, the aromatic hydrocarbons naphthalene and anthracene. These were now subjected to the full power of three-dimensional analysis,39 and the earlier conclusions were verified but made much more accurate. It was possible to establish experimentally the bond-length variations in the aromatic rings that had already been predicted theoretically, and the hydrogen atoms were quite clearly defined for the first time. In Fig. 10(3) we show (a) the results of W. H. Bragg's 1922 investigation in which the positions of the molecules in the unit cells were correctly defined and a clue as to their orientation was discovered, (b) the results of the two-dimensional 1933 investigation showing an electron density projection of the anthracene molecule in which some but not all of the carbon atoms are separately resolved, and (c) a section of the electron density distribution evaluated in the mean plane of the molecule, from the 1950 three-dimensional analysis. The increasing power of our methods is strikingly revealed by these pictures. In the last the hydrogen atoms can be seen, and it is possible to measure the carbon-carbon bond lengths with great precision. The molecule was found to be planar to within about one hundredth of an Ångström unit, although this plane does not, of course, coincide with any crystallographic plane. However, this is not quite the end of the story, and in the next decade we shall describe a still more accurate refinement of these structures. Fig. 10(3a). 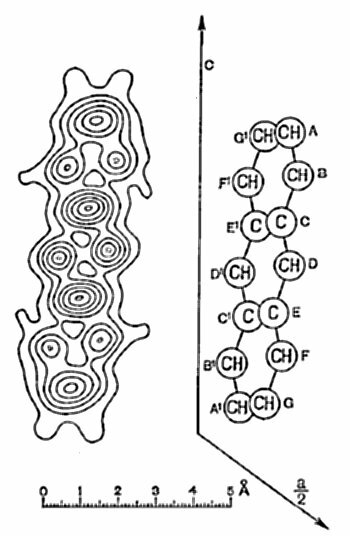 Unit cells of naphthalene and anthracene, showing positions of molecules (W. H. Bragg, 1922). Fig. 10(3b). Electron density projection of anthracene molecule (J. M. Robertson, 1933). Fig. 10(3c). A section through the mean plane of the anthracene molecule, showing the electron density distribution. Contour levels at intervals of 1/2 e.Å-3, the half-electron line being dotted (Mathieson, Robertson and Sinclair, 1950). Accurate and detailed structures for many other simple molecules were determined during this period. One important and extremely early three-dimensional analysis for the terpenoid geranylamine hydrochloride40 may be noted, while the stereochemistry of various camphor derivatives41 was elucidated by the isomorphous substitution method. While it is impossible even to mention the numerous important structures that were determined during these years, attention should be drawn to one very significant feature of general development which now arose from the increasing power of the X-ray method. This was the beginning of really systematic surveys of related compounds, in place of the earlier rather haphazard development of the subject. Formerly it was usually necessary to search for a structure which because of some simplifying feature was likely to yield to the available methods of analysis with a reasonable expenditure of time and effort. Now it began to be possible to select a chemically interesting and important structure and attempt its detailed analysis with a reasonable prospect of success. The best example of this is found in the beautiful series of strikingly accurate studies on amino acids and simple peptides carried out mainly in the Pasadena school. The structures of glycine,44 alanine,45 serine,46 threonine,47 N-acetylglycine,48 β-glycylglycine,49 diketopiperazine50 and many other compounds were determined. These results were of great importance in formulating possible structures for the proteins. The bond lengths and angles obtained were used to derive the dimensions of the polypeptide chain, and they form the basis for the helical models of protein structure proposed by Pauling51 that have proved to be so important. The problem of molecular compounds, in which two types of molecule appear to be united without any obvious attractive forces operating between them, had been a puzzle to chemists for generations. This general problem was now very completely studied and partially solved by X-ray crystallographic studies. The work of H. M. Powell55 and his collaborators on the quinol cage structures, or clathrates, is the most outstanding example in this field. Such structures are exceedingly complex, and often disordered, but the foundations of a new kind of chemistry were firmly laid by this work. Finally, in the field of chemically unknown or incompletely determined structures we must first refer to the important and early determinations of the structure of cholesteryl iodide by Carlisle and Crowfoot56 and of a calciferol derivative (calciferyl-4-iodo-5-nitrobenzoate, C35H46O4I) by Crowfoot and Dunitz.57 These were probably the first applications of the heavy atom method to such complex and asymmetric structures. Although the chemistry was known, the exact configurations and stereochemistry were now fully determined for the first time. The same can be said of the complex alkaloid strychnine, determined independently from the hydrobromide by J. H. Robertson and Beevers58 and from the isomorphous sulphate and selenate by Bokhoven, Schoone and Bijvoet.59 A very great deal of fundamental chemical work had been carried out on this structure and most of it was known before the X-ray work began. The X-ray work, however, carried out by the heavy atom and by the isomorphous substitution methods, was quite independent of chemical theory, and not only verified the structure in every detail but also provided a complete picture of the stereochemistry. The power of the X-ray method in aiding the organic chemist to elucidate a difficult and completely unknown structure was perhaps first most conclusively demonstrated in the work on penicillin during the war years, when computing methods were still primitive and laborious. The formula for benzylpenicillin (II) may not now appear to be unduly complicated, but the chemistry is extremely difficult and unusual. The analysis was finally achieved through the rubidium, potassium and sodium salts, which are not all isomorphous.60 A feature of the work was the close collaboration at every stage between the crystallographers and the chemists. The final result establishes the intricate spatial arrangement of the atoms in full detail, and, as is well known, has led to profound advances in the fields of chemistry and medicine. Any adequate description of the development of organic structure analysis during the last ten years is extremely difficult because the work cannot yet be seen in perspective. It seems likely, however, that this will be remembered as the period when the discoveries and developments of earlier years first came to full fruition, and when the real impact of X-ray analysis on the science of organic chemistry was revealed. We have already stressed the importance of computational work and the magnitude of the problems involved when full three-dimensional surveys of complex structures are attempted. For years this had been the bottle-neck. The outstanding structure determinations that we have already described were nearly all performed with great difficulty and were only completed, often inadequately completed, after the most strenuous efforts. The development and general availability of fast electronic digital computers has now radically changed the whole outlook in X-ray crystal analysis, as it has in many other branches of science. It is, of course, easy to exaggerate this aspect. The computer has not solved the phase problem. But if phase determination can be effected by the use of some complex heavy atom derivative, or by a series of such derivatives, then complexity of the structure or lack of resolution are no longer the limiting factors. Indeed, complete three-dimensional analyses can now be effected with less effort than was required for comparable two-dimensional analyses in the 1930's and 1940's. The impact of these last ten years on our science can be vividly seen by comparing two important volumes on Computing Methods and the Phase Problem in X-Ray Crystal Analysis.61 In the first of these, written in 1950, Mina Rees, from the Office of Naval Research, pointed out in her introduction that high speed digital computers were 'still just over the horizon'. The book is concerned with many aspects of the phase problem, and with the description of many analogue computers, including the extremely important X-RAC and S-FAC machines. On the other hand, the 1960 volume is largely written in a language that would not have been understood in 1950, because a major portion of it deals with programmes and the programming of all the varied operations of crystal analysis for over a dozen different kinds of high speed electronic digital computer that are now available in nearly every country of the world. These great advances in technique have naturally led to an ever-increasing number of significant organic structure determinations, and it becomes more difficult than ever to present anything like an adequate picture of what has been achieved. Once again, however, we may draw attention to advances in two main directions; the more intensive and more accurate refinement of relatively simple structures on the one hand, and the determination of complex and chemically unknown structures on the other. As an example of the first, we may return once more to our old friends naphthalene and anthracene. 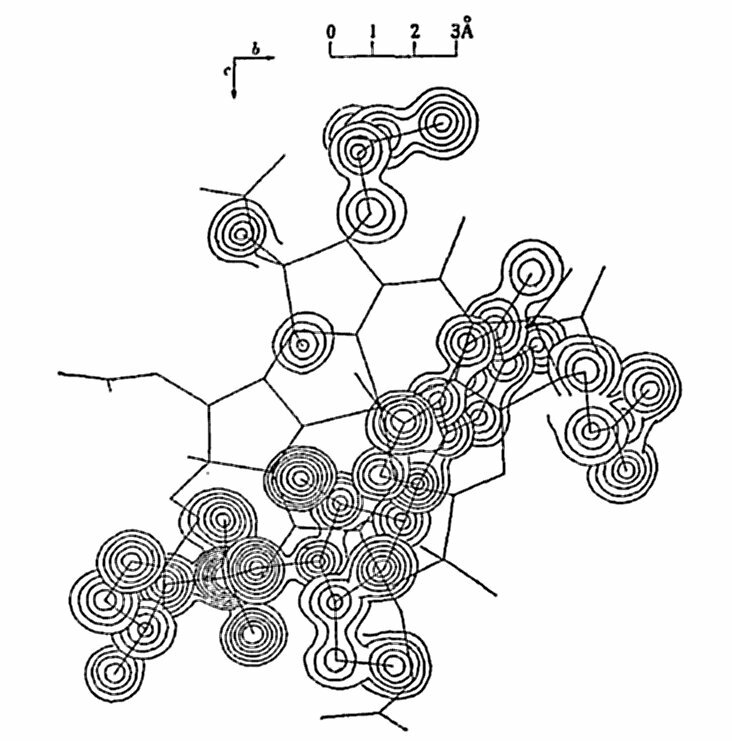 The electron density map shown in Fig. 10(3c) is a very direct representation of the experimental results, which can only be altered if more accurate or more complete intensity measurements become available. In deriving this map no assumptions were made regarding the existence of hydrogen atoms or regarding the exact form of the scattering curve for carbon. From this point, however, it is possible to carry out much further refinement, and try to interpret the results in terms of the thermal vibrations of the atoms and the distribution of electronic charge density. Elaborate refinements to this end have now been carried out by Cruickshank.62 Assuming a theoretical form factor for carbon63 it is possible to evaluate the anisotropic thermal motion. For this a symmetric tensor with six independent components is required for each atom to characterize its vibrations. These thermal parameters and the three positional parameters for each atom may be refined simultaneously. Elaborate and lengthy calculations are thus required, which Cruickshank has been able to programme for the electronic computer. 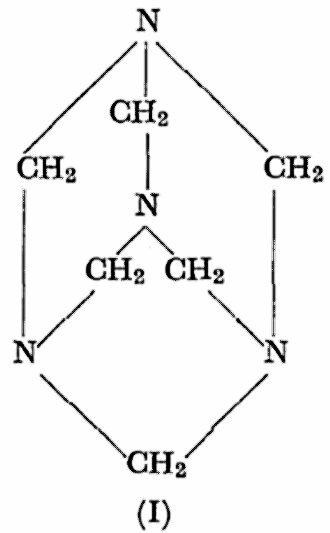 Without this aid it has been estimated that these detailed refinements of the naphthalene and anthracene structures would have taken 100 man-years to complete if they had been attempted in the 1940's. From the results of this detailed study of thermal motion the molecule is shown to behave very largely like a rigid body, oscillating with amplitudes of several degrees about its centre point. Care was taken to evaluate the thermal parameters from the intensities of the high-order reflections only, because for these the X-ray scattering is due almost entirely to the inner electrons of the atoms (K shell), which are not involved in chemical bonding. Now, in order to obtain a picture of the bonding electrons, the set of 14 vibrating but non-bonded carbon atoms and the 10 hydrogen atoms, as defined by their appropriate wave functions, were subtracted away from the experimentally observed electron distribution (Fig. 10(3c)). The result is perhaps hardly conclusive as yet, because the experimental measurements are not sufficiently accurate, but there is a fairly definite indication of a slight channelling of the residual electrons along the bonds and around the aromatic rings. This example may serve to indicate the kind of detailed picture of molecular structure that can be expected in the future when measurements become more precise and our powers of interpretation are increased. In the field of complex molecules the most outstanding example during this decade has undoubtedly been the complete solution of the structure of vitamin B12 by D. C. Hodgkin, J. G. White and their many collaborators.67 Furthermore, this feat was accomplished during the early years of the period, and before computing methods had nearly reached their present state of high efficiency. As a complete structure determination it can still be considered the crowning triumph of X-ray crystallographic analysis, both in respect of the chemical and biological importance of the results and the vast complexity of the structure. The formula, C63H88O14N14PCo together with about 24 molecules of water, shows that, even without counting hydrogen, there are about 350 positional parameters to determine. The cobalt atom is far too light for anything like complete phase determination. Nevertheless, with this as a starting point, and with great determination and skill, involving what can only be described as gifted intuition at some points, the complete structure was finally elucidated. When the work first started in 1948 there was no information about the chemical nature of the vitamin. However, as in the case of penicillin, chemical work and degradative studies went on in close collaboration with the crystallographic work, and during the next eight years the chemistry of various groups within the molecule was determined. A nucleotide-like group consisting of a benziminoazole ribose phosphate, a propanolamine residue and various amides and a cyanide group were discovered. There was also a large fragment containing cobalt which could be some kind of porphyrin-like nucleus. However, there was no evidence as to how all these groups might be linked together. The X-ray work proceeded by gradual stages and quite early there was direct X-ray evidence for some kind of a planar porphyrin-like unit. Additional atoms were gradually introduced into the phasing calculations, and the structure slowly became more clearly resolved. Both the wet and the air-dried crystals were examined, and a lot of help was obtained from the study of other derivatives, especially a seleno-cyanate, B12SeCN, which had a second heavy atom, and a hexacarboxylic acid obtained by Todd and his co-workers by degradation. Finally, the whole structure was obtained with remarkable precision, as shown by the superimposed sections of the three-dimensional electron density distribution reproduced in Fig. 10(4a) and 10(4b). The chemical structure, which can now be written as (III), contains many surprising and unusual features, such as the direct linking of two of the five-membered rings on the central nucleus. The whole arrangement is extremely compact and is found to conform very precisely to various stereochemical rules that have emerged from the study of many simpler organic systems. Fig. 10(4a). 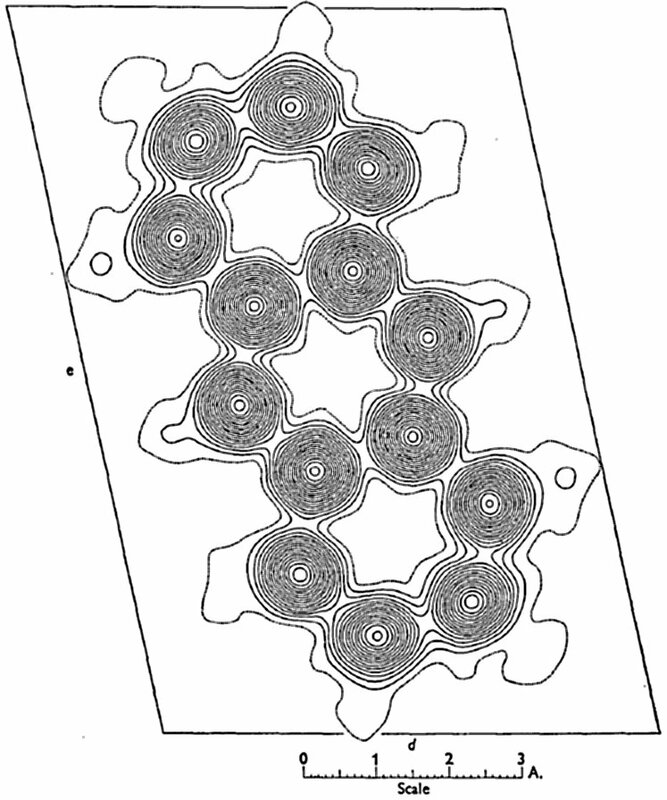 A portion of the electron distribution in the wet B12 crystal, showing the nucleus and most of its side chains (D.C. Hodgkin et al.). Fig. 10(4b). The remainder of the B12 structure showing the benziminoazole, ribose, phosphate and propanolamine groups, with some of the remaining side chains (D.C. Hodgkin et al.). 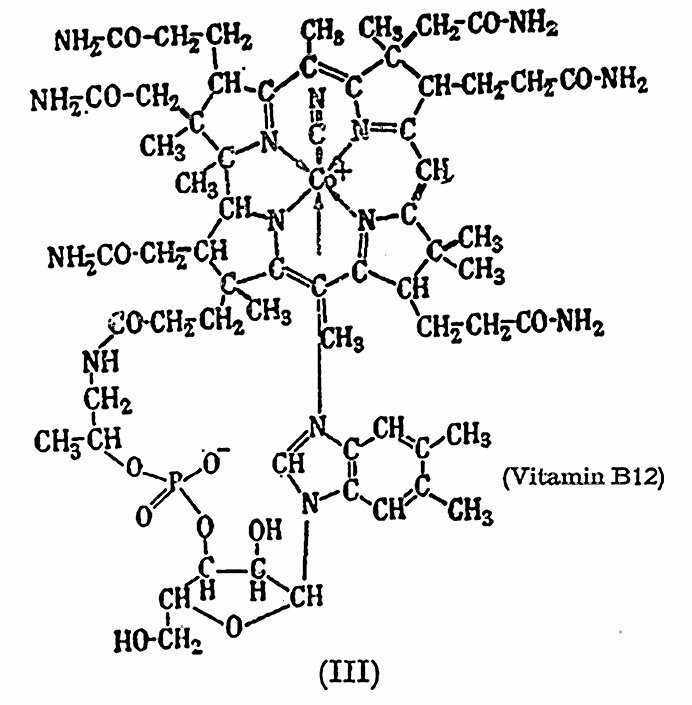 Since the solution of the B12 structure, the analysis of complex and chemically unsolved natural product structures has gone on apace. Many important contributions have come from Australia by the work of A. McL. Mathieson and his team, in both the alkaloid and terpenoid fields, from Canada by the work of Maria Przybylska, from the laboratories of Ray Pepinsky, W. N. Lipscomb and others in the United States, from Oxford and Cardiff in England. Another important recent development has been the accurate determination of the spatial arrangement of the atoms in large and medium ring aliphatic compounds by J. D. Dunitz and his co-workers in Zurich. A very large number of important natural product structures has recently been solved by the Glasgow school, using three-dimensional analysis with phase determination based on a heavy atom derivate. 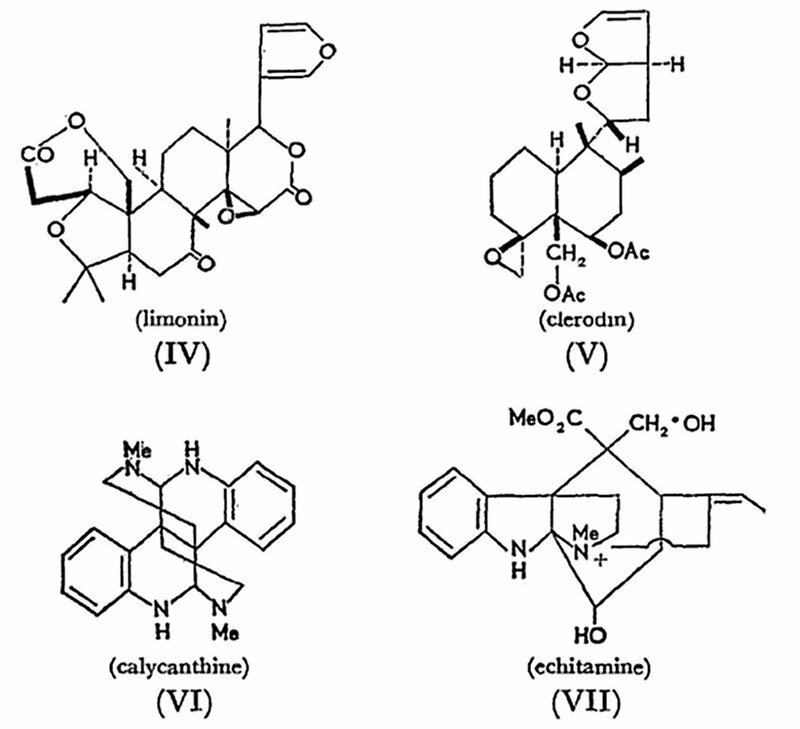 These include the terpenoids isoclovene, β-caryophyllene alcohol, and geigerin, the bitter principles limonin (IV),68 clerodin (V),69 and cedrelone, the alkaloids calycanthine (VI),70 echitamine (VII),71 and macusine A, and many other similar investigations are now in progress. Owing to the complicated crystal structure, with two molecules in the asymmetric crystal unit, the solution of the limonin structure involved finding the positions of 76 atoms other than hydrogen. The structure now found (IV) shows it to be a triterpenoid of the euphol type, and this has solved one of the long-standing problems in chemistry, since this bitter principle of citrus fruits was first discovered in 1841. The other structures shown below have also cleared up many chemical problems, because for years there has been controversy about their precise formulas. Having presented a brief sketch of present day work in organic structure determination by the X-ray method, it is now necessary to enquire about the future and ask what all this is going to lead to. In the field of simple and even moderately complex structures we may expect still higher precision, not only in bond length measurements but in the direction of mapping out the entire electron distribution. Such very complete physical pictures of molecules must be the background against which fundamental valency theory will develop, and we can perhaps expect the science of chemistry now to move fairly rapidly from an empirical to a more strictly theoretical basis. In the case of those complex structures on the edge of the ever growing field of chemistry, we can now state with some confidence that we know how to use the X-ray method to solve unknown structures containing up to 100 atoms or more in the molecule. This can often be done more quickly and always far more precisely than by the classical methods of organic chemistry. This accomplishment, however, now raises a very serious problem for the immediate future. In the past many of the great discoveries of organic chemistry have been made in the course of the long and patient investigations that are required in the elucidation of natural product structures. While solving a structure the chemist does far more than merely find the relative positions of the atoms in space. He makes many discoveries and learns a lot of chemistry, which can often be utilised, for example, in effecting a total synthesis of the compound out of its elements. The X-ray crystallographer can now tell him the positions of the atoms very accurately and often very quickly, but cannot enlighten him about the discoveries that might have been made during a detailed chemical analysis. There is perhaps a real danger that unless serious thought is given to this matter the cause of organic chemistry may not be advanced by this work. It could even be retarded. It is clear that a lot of re-thinking is required, and that, given the structural formula, the chemist must learn to devise rapid and decisive experiments that will enable a full and effective understanding of the chemistry involved to be gained. Perhaps we solve some problems only to create others. In the long run, however, it is quite certain that a tremendous advance has now been made, and that in another ten years' time organic chemistry will be a very different subject from what it is to-day. 1. W. Friedrich, Physik. Z., 1913, 14, 317; M. de Broglie and E. Friedel, Compt. rend., 1923, 176, 738; S. H. Piper and E. N. Grindley, Proc. Phys. Soc. (London), 1923, 35, 269; Z6, 31; A. Muller, J. Chem. Soc., 1923, 123, 2043. 2. W. H. Bragg and W. L. Bragg, Nature, 1913, 91, 557; Proc. Roy. Soc. (London), 1913, A89, 277. 3. P. P. Ewald, Sitzber. math.-physik. Klasse bayer. Akad. Wiss. München, 1914, p. 325; P. Debye and P. Scherrer, Physik. Z., 1916, 17, 277; 1917, 18, 291; A. W. Hull, Phys. Rev., 1917, 10, 661; J. D. Bernal, Proc. Roy. Soc. (London), 1924, A106, 749; 0. Hassel and H. Mark, Z. Physik., 1924, 25, 317; C. Mauguin, J. Phys., 1925, 6, 38. 4. W. H. Bragg, Proc. Phys. Soc. (London), 1921, 34, 33; 1922, 35, 167. 5. W. H. Bragg, Z. Krist., 1928, 66, 22. 6. R. G. Dickinson and A. L. Raymond, J. Amer. Chem. Soc., 1923, 45, 22; G. W. Gonell and H. Mark, Z. physik. Chem., 1923,107, 181. 7. S. B. Hendricks and C. Bilicke, J. Amer. Chem. Soc., 1926, 48, 3007; R. G. Dickinson and C. Bilicke, ibid., 1928, 50, 764. 8. K. Becker and W. Jancke, Z. physik. Chem., 1921, 99, 242, 267; H. Mark and K. Weissenberg, Z. Physik, 1923, 16, 1; S. B. Hendricks, J. Amer. Chem. Soc., 1928, 50, 2455; R. W. G. Wyckoff, Z. Krist., 1930, 75, 529; 1932, 81, 102; R. W. G. Wyckoff and R. B. Corey, ibid., 1934, 89, 462; P. Vaughan and J. Donohue, Acta Cryst., 1952, 5, 530. 9. S. B. Hendricks, Z. Krist., 1928, 67, 106, 119, 465, 274; 68, 189; R. W. G. Wyckoff, ibid., 1928, 67, 91, 550; 68, 231. 10. K. Lonsdale, Nature, 1928, 122, 810; Proc. Roy. Soc. (London), 1929, A123, 494; Trans. Faraday Soc., 1929, 25, 352. 11. A. Muller, Proc. Roy. Soc. (London), 1928, A120, 437. 12. G. Shearer, Proc. Roy. Soc. (London), 1925, A108, 655; R. Robinson, Nature, 1925, 116, 45. 13. W. H. Bragg, Trans. Roy. Soc. (London), 1915, A215, 253; P. P. Ewald, Z. Krist., 1921, 56, 129; W. Duane, Proc. Nat. Acad. Sci. U.S., 1925, 11, 489; R. J. Havighurst, ibid., 1925,11, 502; A. H. Compton, X-Rays and Electrons, New York: Van Nostrand and Co., 1926; A. H. Compton and S. K. Allison, X-Rays in Theory and Experiment, New York: Van Nostrand and Co., 1935; W. L. Bragg, Proc. Roy. Soc. (London), 1929, A123, 537. 14. C. A. Beevers and H. Lipson, Phil. Mag., 1934, 17, 855; Nature, 1936, 17, 825; Proc. Phys. Soc. (London), 1936, 48, 772; C. A. Beevers, Acta Cryst., 1952, 5, 670; J. M. Robertson, Phil. Mag., 1936, 21, 176; A. L. Patterson, ibid., 1936, 22, 753; A. L. Patterson and G. Tunell, Amer. Mineral., 1942, 27, 655; J. M. Robertson, J. Sci. Instruments, 1948, 25, 28; idem, Nature, 1936, 138, 683. 15. J. M. Robertson, Proc. Roy. Soc. (London), 1933, A140, 79; A141, 594; A142, 659, 674. 16. L. Pauling, The Nature of the Chemical Bond, Ithaca, N.Y.: Cornell University Press, 1939. 17. J. M. Robertson, Proc. Roy. Soc. (London), 1936, A157, 79; J. M. Robertson and A. R. Ubbelohde, ibid., 1938, A167, 122. 18. J. D. Bernal, Chemistry & Industry, 1932, 51, 259, 466; Nature, 1932, 129, 277, 721. 19. O. Rosenheim and H. King, Chemistry & Industry, 1932, 51, 464,954; Nature, 1932, 130, 513; H. Wieland and E. Dane, J. physiol. Chem., 1932, 210, 268. 20. A. L. Patterson, Phys. Rev., 1934, 46, 372; Z. Krist., 1935, 90, 517. 21. D. Harker, J. Chem. Phys., 1936, 4, 381. 22. J. M. Robertson, J. Chem. Soc., 1935, p. 615; 1936, p. 1195; J. M. Robertson and I. Woodward, ibid., 1937, p. 219; idem, ibid., 1940, p. 36. 23. J. M. Cork, Phil. Mag., 1927, 4, 688. 24. D. M. Crowfoot (D. C. Hodgkin), Chem. Soc. Ann. Repts., 1936, 33, 214. 25. J. M. Robertson, Nature, 1939, 143, 75. 26. J. D. Bernal, D. Crowfoot, and I. Fankuchen, Trans. Roy. Soc. (London), 1940, A239, 135. 27. C. W. Bunn, Trans. Faraday Soc., 1939, 35, 482. 28. R. C. L. Mooney, J. Amer. Chem. Soc., 1941, 63, 2828. 29. M. Polanyi, Naturwisssenschaften, 1921, 9, 228; K. H. Meyer and H. Mark, Z. physik. Chem., 1929, B2, 115; E. Sauter, ibid., 1937, B35, 83; K. H. Meyer and L. Misch, Helv. Chim. Acta, 1937, 20, 232; S. T. Gross and G. L. Clark, Z. Krist., 1938, 99, 357. 30. J. R. Katz, Naturwissenschaften, 1925, 13, 411; Kolloid-Z., 1925, 36, 300; 37, 19; K. H. Meyer and H. Mark, Ber., 1928, 61, 1939; C. S. Fuller, Ind. Eng. Chem., 1936, 28, 907; C. W. Bunn, Proc. Roy. Soc. (London), 1942, A180, 40, 67, 82. 31. E. W. Hughes, J. Amer. Chem. Soc., 1941, 63, 1737. 32. A. D. Booth, Trans. Faraday Soc., 1946,42,444, 617. 33. A. D. Booth, Nature, 1948, 161, 765; W. Cochran, Acta Cryst. 1951, 4, 408. 34. D. Harker and J. S. Kasper, Acta Cryst., 1948, 1, 70; J. Gillis, Nature, 1947, 160, 866; Acta Cryst., 1948, 1, 76, 174; D. Sayre, ibid., 1952, 5, 60; W. Cochran, ibid., 1952, 5, 65; W. H. Zachariasen, ibid., 1952, 5, 68. 35. J. M. Robertson, Nature, 1943, 152, 411; M. J. Buerger, Acta Cryst., 1950, 3, 87; idem Proc. Nat. Acad. Sci. U.S., 1950, 36, 376, 738. 36. Computing Methods and the Phase Problem in X-ray Crystal Analysis, State College, Pa., 1952; J. Karle and H. Hauptman, Acta Cryst., 1950, 3, 181. 37. R. Pepinsky, J. Applied Phys., 1947, 18, 601. 38. L. J. Comrie, G. B. Hey and H. G. Hudson, J. R. Statist. Soc. Suppl., 1937, 4, 210; P. A. Shaffer, V. Schomaker, and L. Pauling, J. Chem. Phys., 1946, 14, 648, 659; J. Donohue and V. Schomaker, Acta Cryst., 1949, 2, 344; E. G. Cox and G. A. Jeffrey, ibid., 1949, 2, 341; E. G. Cox, L. Gross, and G. A. Jeffrey, ibid., 1949, 2, 351; M. D. Grems and J. S. Kasper, ibid., 1949, 2, 347. 39. A. McL. Mathieson, J. M. Robertson, and V. C. Sinclair, Acta Cryst., 1950, 3, 245, 251. 40. G. A. Jeffrey, Proc. Roy. Soc. (London), 1945, A183, 388. 41. E. H. Wiebenga and C. J. Krom, Rec. trav. chim., 1946, 65, 663. 42. J. M. Bijvoet, Koninkl. Nederland. Akad. Wetenschap., 1949, 52, 313; A. F. Peerdeman, A. J. van Bommel, and J. M. Bijvoet, ibid., 1951, 54, 3; D. Coster, K. S. Knol, and J. A. Prim, Z. Physik, 1930, 63, 345. 43. Y. Okaya, Y. Saito and R. Pepinsky, Phys. Rev., 1955, 98, 1857; R. Pepinsky and Y. Okaya Proc. Nat. Acad. Sci. U.S., 1956, 42, 286. 44. G. Albrecht and R. B. Corey, J. Amer. Chem. Soc., 1939, 61, 1087. 45. H. A. Levy and R. B. Corey, J. Amer. Chem. Soc., 1941, 63, 2095; J. Donohue, ibid., 1950, 72, 949. 46. D. P. Shoemaker, R. E. Barieau, J. Donohue, and C. S. Lu, Acta Cryst., 1953, 6, 241. 47. D. P. Shoemaker, J. Donohue, V. Schomaker, and T. B. Corey, J. Amer. Chem. Soc. 1950, 72, 2328. 48. G. B. Carpenter and J. Donohue, J. Amer. Chem. Soc., 1950, 72, 2315. 49. E. W. Hughes and W. J. Moore, J. Amer. Chem. Soc., 1949, 71, 2618. 50. R. B. Corey, J. Amer. Chem. Soc., 1938, 70, 1598. 51. L. Pauling and R. B. Corey, J. Amer. Chem. Soc., 1950, 72, 5349; L. Pauling, R. B. Corey, and H. R. Branson, Proc. Nat. Acad. Sci. U.S., 1951, 37, 205; L. Pauling and R. B. Corey, ibid., 1951, 37, 235, 241, 251, 256, 261, 272, 282, 729; ibid., 1952, 38, 86. 52. C. A. Beevers and W. Cochran, Proc. Roy. Soc. (London), 1947, A190, 257. 53. T. R. R. McDonald and C. A. Beevers, Acta Cryst., 1950, 3, 394. 54. P. F. Eiland and R. Pepinsky, Acta Cryst., 1950, 3, 160. 55. H. M. Powell and P. Riesz, Nature, 1948, 161, 52; H. M. Powell, J. Chem. Soc., 1950, pp. 298, 300, 468. 56. C. H. Carlisle and D. Crowfoot, Proc. Roy. Soc. (London), 1945, A184, 64. 57. D. Crowfoot and J. D. Dunitz, Nature, 1948, 162, 608. 58. J. H. Robertson and C. A. Beevers, Acta Cryst., 1951, 4, 270. 59. C. Bokhoven, J. C. Schoone, and J. M. Bijvoet, Acta Cryst., 1951, 4, 275. 60. D. Crowfoot, C. W. Bunn, B. W. Rogers-Low, and A. Turner-Jones, The Chemistry of Penicillin, Princeton: Princeton University Press, 1949, p, 310; G. J. Pitt, Acta Cryst., 1952, 5, 770. 61. (i) Report of a conference held at The Pennsylvania State College, 1950. Edited by Ray Pepinsky. State College, Pa. 1952. (ii) Report of a conference held at Glasgow, 1960. Edited by Ray Pepinsky, J. M. Robertson and J. C. Speakman. Pergamon Press, London. 1961. 62. D. W. J. Cruickshank, Acta Cryst., 1956, 9, 747, 915. 63. R. McWeeny, Acta Cryst., 1951, 4, 513. 64. J. C. Speakman and H. H. Mills, J. Chem. Soc., 1961, 1164. 65. A. J. van Bommel and J. M. Bijvoet, Acta Cryst., 1958, 11, 61. 66. F. L. Hirshfeld and G. M. J. Schmidt, J. Chem. Phys., 1957, 26, 923. 67. D. C. Hodgkin, J. Kamper, J. Lindsey, M. MacKay, J. Pickworth, J. H. Robertson, C. B. Shoemaker, J. G. White, R. J. Prosen, and K. N. Trueblood, Proc. Roy. Soc. (London), 1957, A242, 228. 68. S. Arnott, A. W. Davie, J. M. Robertson, G. A. Sim, and D. G. Watson, Experientia, 1960, 16, 49. 69. G. A. Sim, T. A. Hamor, I. C. Paul, and J. M. Robertson, Proc. Chem. Soc., 1961, p. 75. 70. T. A. Hamor, J. M. Robertson, H. N. Shrivastava, and J. V. Silverton, Proc. Chem. Soc., 1960, p. 78. 71. J. A. Hamilton, T. A. Hamor, J. M. Robertson, and G. A. Sim, Proc. Chem. Soc., 1961, p. 63.